This is a quick and easy look for day, which does not require a lot of time, effort, or products. 1. Apply primer to lids to minimize discolorations. 2. Trace black liner along lashlines, keeping color intense at the base of your lashes. 3. 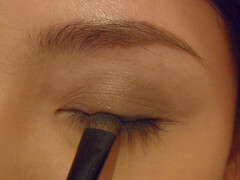 Apply soft brown onto your lids. I like to go just above the crease (eyes open), and not winged out. 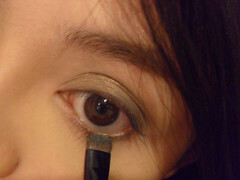 4.With a smudger brush, apply the soft brown to lower lashline as well. 5. Use a matte black eyeshadow and the smudger brush to push a line of black into the base of your lashes as a liner. 6. Curl lashes and apply mascara. 7. Apply a shimmery coral blusher for a subtle flush. I use a light, light hand, to keep shimmery blushers from looking too scary.